Un Lun Dun. Say it quickly, in one go. UnLunDun. Does it make sense? That's it. UnLondon. Un-London. Un Lun Dun is a Young Adult Fantasy book by China Mieville, an English writer of weird fantasy. Un Lun Dun is set in the fantasy world of UnLondon, a city which lies on the brink of London, formed out of the debris of the city, where anything or anyone that is obsolete within London is transported and takes on a life of its own. Every city in the world has one such Un-city or abcity. Paris has Parisn't, Rome has Romeless and Helsinki has Helsunki. An UnSun shaped like a loop shines its light on UnLondon and at night, the white Loon smiles down on the abcity. Cutting the city cleanly in two parts, the Smeath flows through UnLondon, and its skyline is dotted by many iconic structures, the best amongst them perhaps the Webminster Abbey. It's a treat for any London-lover and a testament to the bizarreness of the city. Zanna is a young girl living in London. She's been having some weird experiences lately, strange people recognize her on the street, animals seem to be staring at her funny and once, her friend Deeba saw a cloud shaped like Zanna's face. Following her around, whispered in corners and graffiti-ed on walls is a word - "choisi" or "Schwazzy" - French for chosen" as she is called. That's what she is - the chosen one, but chosen for what? Zanna travels to UnLondon to find out what destiny has in store for her, and she takes her friend Deeba along with her on what turns out to be the most twisted adventure ever. The Smog has started to take over the city of UnLondon. It is a shapeless entity comprising all the smoke and pollution emitted across the twin abcities of London and UnLondon. It's a sentient smog, and it is angry, hidden away after being vanquished from London by what was rumoured to be a band of magicians. The Smog is now secretly planning to overthrow the existing powers in UnLondon and take over the world. A prophecy in UnLondon says that no one can stop the Smog, except the chosen one. But when Zanna reaches UnLondon, the UnLonders hopes wane, because the Chosen One is just a clueless young girl, easily squashed by the mighty Smog. What will happen when the Smog defeats Zanna? Un Lun Dun is a Young-Adult book through and through. It is fast, it is witty in that dry teenagerey way and it has a lot of excitement without the need for explanation and a healthy dose of puns and wordsmithery. It is a plot-driven book which works because its characters are utterly likeable. The main character, Deeba, initially thought to be a sidekick of the chosen one, comes through to be our hero of the book. The book keeps surprising you at every turn of events - the story is nowhere near linear... halfway through the book, you wonder what could happen next, because the resolution seems right around the corner. And bang, you end up in the middle of an all new adventure before you can bid goodbye to the first. An excellent quick read for the bored you. It is an emotional ride as well, the book takes on all your typical fantasy tropes - hero, sidekick, destiny, prophecies, Chosen Ones and tasks and treasures - and turns them on their head. He surprises you with a depth that you unfairly would not expect from a children's book. It talks about family also, and friends, and how fickle relationships can be. It shows you the practical problems of being a hero in a fantasy story and in the most fascinating way, shows you how the problems can be done away with. The book knows when not to tug at your heart strings also, and prefers sweet subtleties over maudlin displays. It's quite an experience, one I would rather not spoil with over-analysis. I recommend this book heartily to lovers of fantasy, magic, urban fantasy, alternate worlds..
Un Lun Dun has the most ridiculous cast of characters - a book of prophecies which is quite opinionated indeed, Propheseers who read the book and generally philosophize on people's destinies, a man who can control umbrellas, a half-ghost half-human boy, a milk carton which has a life of its own, and armed dustbins called the Binja who are a security force. Some people populating UnLondon are those who were of no use to London, and slipped through the worlds - they are as M.O.I.L, that is, Mostly Obsolete in London...which is why UnLondon has, among its residents, quite a large population of bus conductors and librarians! A few months ago, I was on a trip to London and got lost underground on the very first day, stranded at Leicester Square with a suitcase and painfully without my passport, money or travel card. It was one of the craziest nights, I ended up in the control room with a bunch of guards trying to call different stations on the Piccadilly line to find my mother, who happened to be on the tube! It was a very Neverwhere thing to happen. 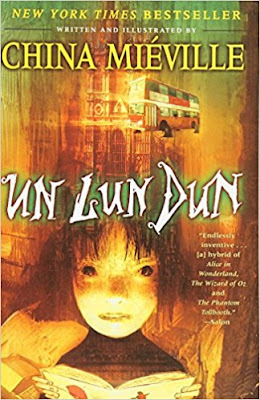 I hadn't read Un Lun Dun at the time, but that night I was pretty much M.O.I.L. myself... mostly obsolete. I just wish I could have ended up in UnLondon. Now that would have been something.